A joint police and fire service operation has taken place in Corby to tackle inconsiderate parking and ensure emergency vehicles can get through. Officers from Corby Town Neighbourhood Policing Team and firefighters from Corby fire station’s Green Watch took a fire engine down residential streets in the Oakley Vale and Great Oakley areas on Sunday (September 3) to see if it could easily get through. These patrols identified 15 parked vehicles which would have prevented emergency access, including incidents of double parking and vehicles parked on corners or obstructing junctions. All but one of the owners were located on the day and after being given advice, moved their vehicles. The idea for the patrols came from Corby/Kettering Safer Community Team officer PC Mark Walker and his colleague PC Brad Wilson, who spoke to drivers alongside the Green Watch firefighters. 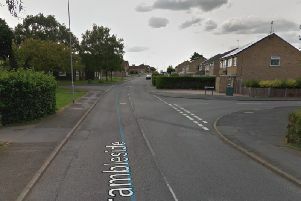 PC Wilson, of the Corby Town Neighbourhood Policing Team, said: “One of the ways we’ve decided to approach parking issues in Corby is to work with Green Watch to highlight the obstructions caused by road users, more often than not unintentionally, to emergency service access. “Fire clearly poses a big risk to people’s safety, and an emergency vehicle of that size being unable to gain access could be very serious. He added no tickets were issued during the exercise and said it would be continued in other areas of the town in the future. Green Watch commander Dave Smith, of Northamptonshire Fire and Rescue Service, said: “Any incident, whether for police or fire, is time critical. “Inconsiderate parking may have life-threatening implications on us getting to where we need to be. “This was a great opportunity to give advice around an on-going issue by making residents aware that some of the parking in these areas could cause serious issues. Parking is a locally identified priority in Corby. These are concerns or issues raised by residents for neighbourhood policing teams to concentrate on. Kettering and Corby community inspector Julie Mead said: “Action like this is a fantastic way to raise awareness of an issue that affects lots of people in the town. Find your local policing team at www.northants.police.uk/neighbourhoods.